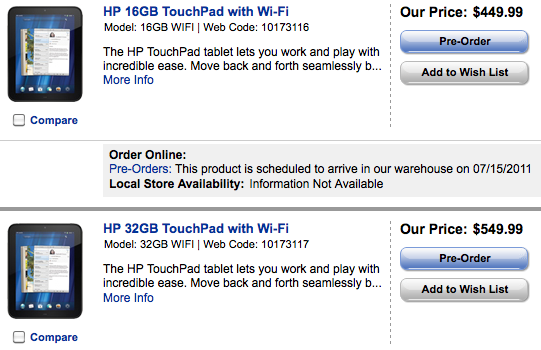 If you’re looking to save money on a new HP TouchPad, it’s looking like Best Buy might be the place to go. Both the American and Canadian divisions of the electronics mega retailer have put the TouchPad on sale, and for once the Canadians are actually getting a better deal than their southern counterparts. Best Buy USA has opted for small undercutting, uh, cuts on the TouchPad, shaving $10 from the 16GB TouchPad, and $20 from the $32GB. That brings the pricing down to $489.99 and $579.99, respectively. It’s not a massive price cut, but we’ll save money where we can. Throw in the $50 “I own a Pre” rebate and you’re looking at getting a 32GB TouchPad for as little as $529.99. Canada, however, gets the better end of this stick. Best Buy Canada has the TouchPad on pre-order, with a slated arrival date of July 15th. And to undercut their maple leaf rivals, the Canadian division of Best Buy is offering $70 off on both storage capacities of the TouchPad. That brings the price down to $449.99 for the 16GB TouchPad and $549.99 for the 32GB TouchPad. Even with the current conversion rate (CA$1.00 = US$1.03), Canada’s getting a better deal on the TouchPad than anybody else. We know, aboot time, eh? Source: Best Buy USA, Best Buy Canada; Thanks to Mattso, sml_blok, and Jordan for the tips!